Am not sure if they were just for decoration or what, but he would also flip out on people if they ordered a foofy cocktail, such as a Cosmopolitan, a Screwdriver…or heck, anything that wasn’t a classic cocktail on his pre-approved list. If you wanted to stay on his good side, you’d order a Martini – one made with gin. An order for a Vodka Martini would get you tossed out. And in contrast to what some “experts” might advise, he didn’t shake or stir his (gin) Martinis, he “pounded” the $2.50 cocktail with a muddler, which resulted in an icy-cold drink, served (of course) in a classic Martini glass. And your change was always a shiny half-dollar coin snapped down on the bar after you paid. 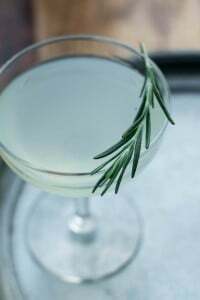 Fortunately, I was a neighbor and never got into trouble there – we just went in, pulled up a stool at the bar (and if there wasn’t one, we knew to just leave and come back another time), and ordered Martini after Martini. Like Bruno, I believe in being on your best behavior at a cocktail lounge. I also believe that you should sit at the bar, I tend to stick with the classics, and I like the right glassware for cocktails. Some of the better cocktail bars in Paris use a certain glass for drinks, a squared-off coupe, which is often listed as being for Champagne. But wide glasses kind of fell out of favor for bubbly since people say the bubbles tend to disappear too quickly. (Hello? If your bubbles are disappearing, drink faster!) But I got obsessed with them and wanted to have a set at home. I searched online and found them, but figuring that I lived in a major city, I should be able to find them in Paris. The first time I went, they were – of course – closed for a fermeture exceptionelle. So I hopped back on my bike and pedaled home. I cooled my heels for a week and went again and lo and behold, I spotted my glass on the shelf. When I brought it to the counter and said I wanted six (you can’t buy just one glass, only six or twelve) – of course – the clerk said, “Hmmm, I think we’re out of stock on those….” So while I once again cooled my heels, pacing around the shelves of the store, oogling the porcelain coffee bowls (which is ridiculous since I already have over a dozen of them cluttering up my cabinet), he came back with a full box of glasses. I decided to break them in with a batch of Torontos, a cocktail introduced to me by Carlos Madriz, the bartender at Le Mary Celeste. It’s a full-on, old-fashioned kind of cocktail – with not a lot of fussy stuff going in. 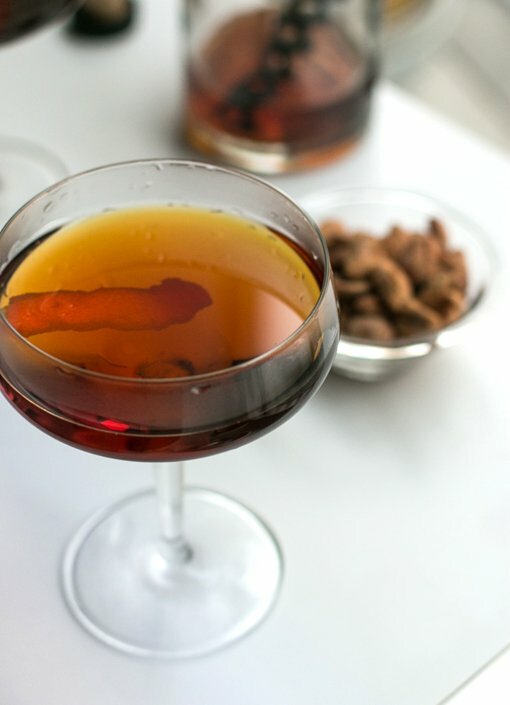 The flavor is earthy from the rye whiskey, with the herbal bitterness of Fernet Branca providing a contrasting backbone to the drink. So I chilled up a few Torontos, sat back (at my counter, of course), and toasted my luck at finding the right glasses. Adapted from ImbibeI made a batch of Torontos and put them in a little aging bottle, which is kind of fun to experiment with. 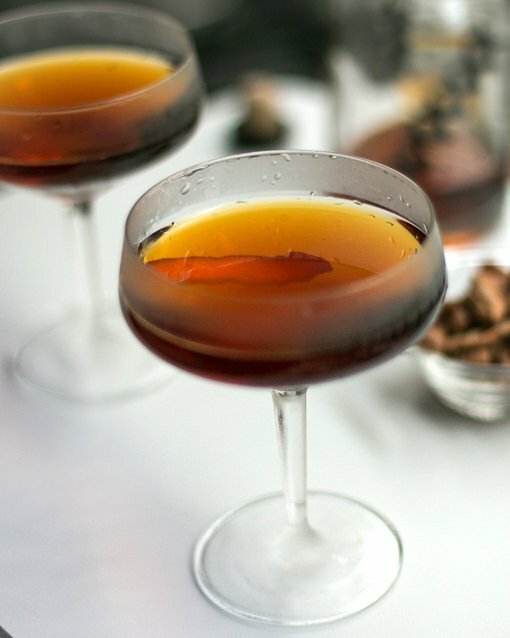 Any bitters that you like would work, such as orange, cardamom, Angostura, or another favorite.To make simple syrup, boil together equal parts sugar and water, stirring, until the sugar is completely dissolved. Let cool to room temperature. You can use 1/4 cup (60ml) water to 1/4 cup (50g) sugar or increase it, if you plan to make more. Any extra can be kept in the refrigerator for a few weeks. 1. Fill a small pitcher halfway with ice. Add the whiskey, Fernet Branca, simple syrup, and bitters. Stir continuously for about a minute, until the mixture is well-chilled. 2. 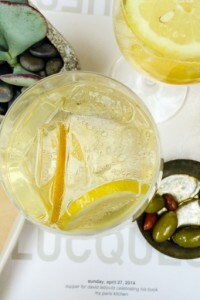 Strain into two cocktail classes and add a strip of orange or tangerine peel to each cocktail. Sadly no longer available, but a true luxury martini, champagne or Toronto vessel. Can’t wait to try this recipe. Thank you! This is my perfect kind of cocktail, definitely saving this to try soon. Thanks for sharing! I have a lot of Schott Zwiesel glassware and love it. They’re worth every penny spent on them. They’re made with titanium instead of lead like most crystal making them healthier and much sturdier than other glassware. They don’t get etched in the dishwasher. If you hand wash and accidentally hit the faucet with one it’ll likely be unscathed. I dropped one once and it didn’t break though I think I was just lucky with that. It made an impression nonetheless. I think you’ll be happy with yours despite Romain’s fretting. Barb, you don’t need to buy an aging bottle per se. You can simply take a la parfait jar, fill it with spirit, and add in some charred oak chips from brouwland.com/en, search for ‘oak chips.’ A little goes a looong way, remember you can always add but you cannot take away, so start with half an ounce per liter and go up from there. The story about the bar man made me laugh, and also reminded me of a new bar I tried for the first time last night (I live in London). Pretty small place, tables in the basement, three on the top floor and about 10 seats at a beautiful copper topped bar. They’re not a restaurant, but it is an Italian bar that serves crostini as bar snacks. When my friend and I walked in we were asked if we were drinking, or eating and drinking. We’d come from a steak supper, so we said drinking, obviously. When I said drinking, they asked us if we wanted to sit at a table or at the bar. The bar was beautiful, and empty. People were sitting at tables, but why would you want to sit at a table when there is space at the bar if you’re just drinking?! Call me old fashioned, but unless my cocktail is coming to me at my table before my meal, I like to sit at the bar and watch it being made. They were fantastic though. I love this cocktail tale and the glasses, as well! Jeff D: Good to know – thanks. I didn’t think they were all that expensive, but since I rarely by glassware, I don’t know what prices should and shouldn’t be. Glad to hear they will stand up well. A number of bars here use them so perhaps they don’t have to deal with breakage either. I talked my wife into getting a larger fridge for exactly the same reason, ice on demand. For the moment it’s not hooked up to the water line though, so I’ve had to manually add ice, and the only ice mold I have is the “Han Solo in Carbonite” one from Thinkgeek, so you can get ice for cocktails from my fridge but they’re all mini han solos. Which isn’t always a bad thing. Re the chips, I think it’s more the oxidation that causes the mellowing. Unless you’re referring to a mellow-er wood/vanillin profile, in which case you could get that by soaking the chips in water or a neutral spirit (or white dog!) first, and then adding them to the cocktail. I do barrel aged homebrew, and have done experiments with different aging times over different types of oak (light, medium, or heavy char, versus no char, versus home-charred) and each one contributes its own profile. 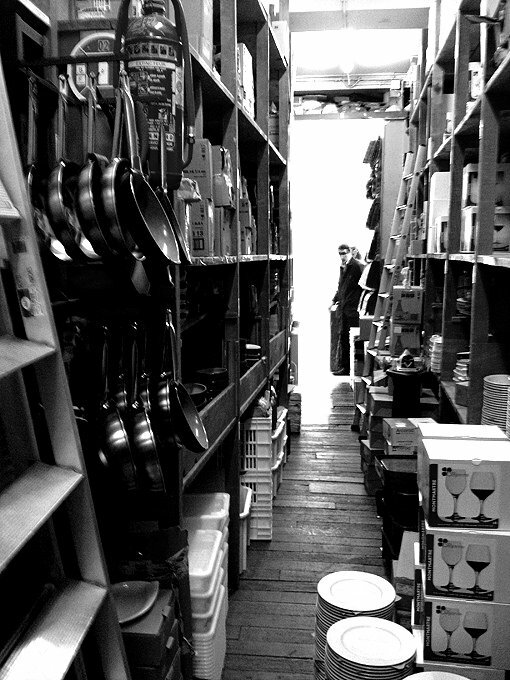 I came across this shop last year by a little scrawled note from another kitchen shop down the street (complete with awkward name and number details hidden in a piece of paper behind it) and I felt like a child looking through hidden treasures… Sure not everything is brilliant but there are some good, inexpensive options. The glasses I really love that I found there were half, and sometimes more, than prices elsewhere. I completely agree that it’s a hidden gem. About “Phil in France” comment; adding wood chips would increase surface topology and interstitial spaces. The first would add surface area and the second traps oxygen under the surface. Both would increase/accelerate oxidation — mellowing. It would be interesting to learn who first created “The Toronto” cocktail. Just as with other great cocktails, I’m sure that the quality of the whiskey used is important to the success of this cocktail. There are several excellent choices available in Canadian whiskeys, including the varieties produced by Forty Creek Distillers (Grimsby, Ontario), Alberta Distillers, (Calgary, Alberta) and Crown Royal, now produced in Manitoba and originally produced in my hometown, Waterloo, Ontario, among others. For those interested in learning more about Canadian whiskey, I would suggest they visit http://www.canadianwhisky.org, as a start. Thanks for the great post, David! From what I read at Imbibe magazine, the drink was invented to highlight the taste of rye/Canadian whiskey/whisky. It’s said that when rye became “out of favor” they stopped calling it rye whiskey. But now that it’s back in favor, brands are pushing it. However since it has to be made with at least 51% rye to be called rye whiskey, they just call it Canadian whisky. But there’s probably more history there than I know! I remember entering the Zam Zam with trepidation, fearful Bruno the Martini Nazi would give me the business and exile me for any small number of reasons…a word spoken too loudly (a habit of mine), a hole in the knee of my jeans (another of that time), an unladylike gesture (seriously). Never happened but that was part of the charm of the place, which grew thin quickly, quite frankly. Ah I knew that we here in Toronto were famous for something other than our crack smoking mayor. I can’t drink alcohol because I get severe migraines from the sulfites. It makes me feel like an idiot when I’m out with my friends and everyone orders a round of cocktails and I have to pass. Or I just drink water at their house when everyone else is mixing their favorite drink. I’ve tried watered down cocktails or just sipping on my drink and I still get sick. Who wants to order a virgin or Shirley Temple at my age. Any suggestions? Don’t forget the Angostura! 1-2 dashes. I don’t know if Imbibe forgot it or if there are, in fact, two ways to skin a cat, but I think Angostura is standard in a Toronto. This is one of my favorite cocktails and it’s great to see it here! I do mention to use bitters, such as Angostura, but I do like other bitters in this cocktail. Cardamom bitters are quite good in it, as are orange. Such a funny story about the bar owner! It reminds me of the “no soup for you!” episode of Seinfeld. Reminds me of Bobby Cook who ran the Owl Tree on the corner of Post and Taylor in San Francisco. He could be pretty crusty with his customers. No, they have a sign that they only sell glassware in packs of 6 or 12. You could find someone to split ’em perhaps? But always good to have more than 2 (which I’ve learned through experience..) as insurance against breakage. Hmmm, Bruno sounds like he could be the twin brother of Mr. La Tona at Caffe Sport, back in the day. I’m liking this Bruno guy. We have similar philosophies on drinking; always sit on a bar and that cocktails should only have two ingredients and ice is one of them. Never heard of The Toronto Cocktail, but it looks good, even thought it surpasses the two ingredient limit. Jen, the trick is to order something that’s not too sweet. I offer my guests pomegranate juice, which is good either over ice or with ice and soda. I also squeeze fresh citrus juice for non-drinkers–grapefruit juice is great, and f you don’t want to drink it plain you could add some grenadine. I don’t see why a bartender wouldn’t invent a nice drink for you along these lines. Thanks Hope, great ideas and I love both pomegranate and grapefruit juice. ahhhh, Bruno. I too was a neighbor and spent many an hour sipping at the bar. Bruno must have liked me because I had many long conversations with him about his stint in the army (travelin’s trouble), and his views on things….. always adamant. If he didn’t like your look he would kick you out and send you down the street “where they make those fancy cocktails” and mutter under his breath “damn hippies”. Manhattans must have been acceptable because I enjoyed many with him….. I love the hollow stem champagne glasses. I know, they’re out of favor now, and really are awkward to use (and clean), but I love’em anyway. I got panic-y when I started seeing all the long narrow flute type glasses flood the market and worried that I’d never find the hollow stems again, but I happened on a flea market and found 8 of the prettiest hollow stemmed that I’d ever seen…and they were cheap (probably because the orig owner switched to those narrow flutes!) I nabbed them all and have become the champagne glass Nazi when I put them out for special occasions. I have no idea who produced them and have never seen them anywhere since, so I can’t replaced them. Daughter has staked her claim on them when…. Regarding the aging technique, how long are we talking? Hours? Days? Just curious, thanks! Oh the zam zam on Haight. I was fortunate to be served a few times – the opening hours were the biggest mystery of all. My favorite non alcholic drink is club soda or sparkling water with a few dashes of bitters. It gives a bit of flavor and some color. And, additionally, do you combine all the ingredients before putting into the aging container? I combined the rye and Fernet in the container. I let it sit for about 3 months. I did a post on La Maison du Whisky (linked at the end of this one) where we tasted various liquors/cocktails that had been aged vs those that weren’t. Some benefited, but not all. I wondered about the name Zam Zam as it’s also the name of one of my favourite restaurants in SIngapore (famous for its delicious murtabak, which is a kind of stuffed roti prata). So I looked it up: turns out it’s a well in Mecca which in Islamic belief is miraculously generated as it has never gone dry. Pilgrims visit it while on Hajj. So a bit ironic as a bar name considering that Muslims don’t drink alcohol! Sounds like a perfect expression of Bruno’s contrarian nature. So, are you saying you use this glass for martinis? My nightly cocktail is a martini made with Plymouth Gin, shaken so it’s icy, icy, icy, but I do occasionally stray and have a Gabrielle Hamilton Negroni. This drink sounds great, and I am going to try it in February. I don’t drink in January to make up for the holidays. It’s a loooooong, dry month. 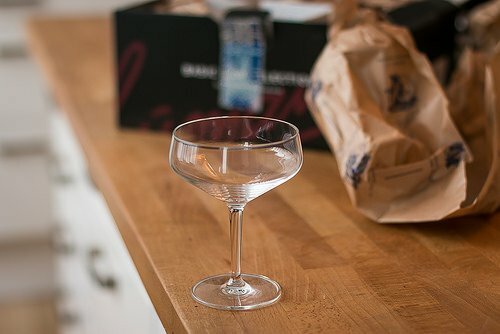 Here’s a very good article from ManMade on aging cocktails at home. A controlled test on Negronis (David, I know you put some Negroni in a small aging barrel, awhile back — the whole topic capture my fancy at the time & stayed with me!). This guy used a few diff aging materials, and simple mason jars. I like his test and analysis. Going to give it a shot! & I just bought those Schott Zwiesel glasses online at Sur la Table (~$78/6, free shipping). Had a gift card that just about covered it! Hope you like the glasses as much as I like mine ~ Thanks for the link to the DIY aging methods. (I shared it on my Facebook page.) It’s nice for someone to go through the motions and test them out side-by-side. The aging bottle is easy although I do wish it was larger. It seems if you’re going to age some cocktails, it’d be nice to do a quart (liter) or so, while you’re at it. Those Jack Daniel’s chips look interesting and may pick some up on my next trip to the US. Ah, Zam Zam! I live around the corner, and it’s my favorite neighborhood bar. Bruno had passed to the cocktail lounge in the sky by the time I moved there, so the bar has a friendlier vibe now than I gather it used to, but it’s still a fine old spot. I love everything about it! Read this post this morning and ran out to get some Fernet Branca! 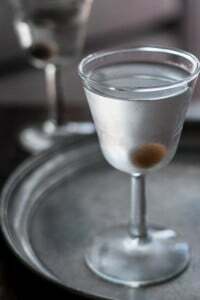 I am a “old lady” drinker and prefer my martini’s extra dry with Bombay Sapphire and a stern look at the Vermouth. Great, great cocktail and post. Thank you. Ah, I think Bruno and I would get along very well indeed (in spite of his bizarre practice of “muddling” Martinis). And while we’re on the subject, strictly speaking there ain’t no such thing as a “Martini glass” – it’s a “cocktail glass”, if you please. the name of the Rye ( ok kidding). This looks like EXACTLY what I need in this subzero weather we’re having in New York. I’m just getting into mixing my own cocktails and don’t have Fernet Branca… is there a handy substitute you recommend so I don’t have to own a lot of different bitters? I always have Angusturo on hand. When I saw “Toronto” I almost spit out my wine! (I thought you had arrived in Toronto!) A cocktail is OK, but would rather see you in Toronto! The Seagram barns where they aged the barrels of “Crown Royal” and “Canadian Club” rye whisky were just down the road from us in nearby Waterloo, and thereby close to Toronto. Close to the whisky aging barns was a beef barn, where the leftover fermented grain mash from the whisky making was fed to the steers as fodder. Let’s just say that these steers were kept “happy”. 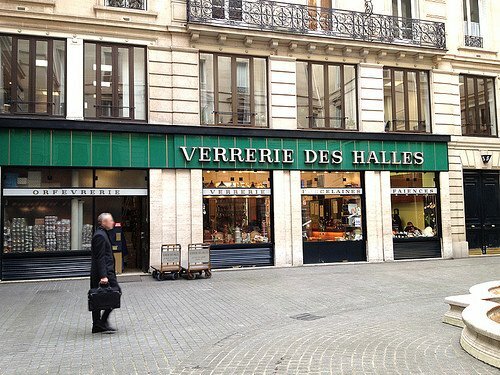 I have many pieces of white bistro dishes from Verrerie des Halles in Paris. A. Simon sent me there to find particular dishes. 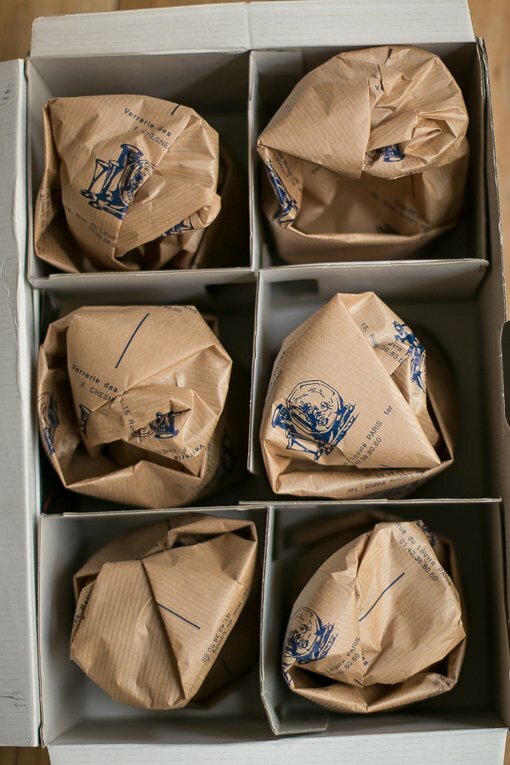 I always think of them when I dry dishes, because they wrapped my purchases in lovely blue and white tea towels with their name on them, which I still use. I read your story to my wife we, we’re thrown out by Bruno many times more than we were served. Brings back memories. We have had a gin martini every Friday since then at home, where no one has the good sense to throw me out. I have a friend who loves margaritas and orders them everywhere she goes. I guess Bruno would have sent us all back to Texas for that indiscretion? Oh well, I would have happily gone! I’m not into cocktails but I love reading about them, I gorged on the wonderful stories, the comments, the links and am glad that you ‘found’ the Verrerie des Halles… I passed by once and was greatly intruiged but of course they were closed – it looks exactly as I thought it might, but I think I would have been disappointed with the ‘limited’ choices – I expected something quite huge where one can stroll and buy for hours on end (and not because there are no sales people around….)! thank you – I DO need a kir Kiki…. I’ve just recently gotten into mixing cocktails at home (it can be a very expensive habit). In any case, this recipe just gives me a good reason to buy some new cocktail stemware. I’m sure it’s the glass that makes all the difference! Oh yeah, and Bruno seems like my kind of guy. @ Jen…I always get bitters and soda with a twist – it’s delicious and tastes like a proper drink instead of just fruit juice. If you’re in a place with a good bartender, you can ask them to come up with a virgin bitters drink for you and that’s always fun – sometimes they have house made bitters and syrups that are amazing! Enjoy! What a fantastic story that’s filled in so many blanks! SF has such a rich history — I love learning more about the stories of its many colorful inhabitants. I lived in Haight Ashbury for a few years until last summer, and was always told that the thing to order at Zam Zam (my favorite bar by far apart from Club Deluxe (especially in the time of Geovanni’s Pizza) in an otherwise wretched hive of scum and villainy) was the gin martini — although no one could explain to me why, and at 9 USD a pop these days, it wasn’t exactly what you’d expect in a dive bar. Still, I love Zam Zam, for its delightfully inappropriate mural, funky decor, and the best juke box in town, and I’d rather order a $9 martini from there than a $10 drink from the pretentious craft cocktail establishment down the street (if you want to know how I really feel) any day. Next time I’m there I’ll raise one to Bruno and his legacy. PS: Those are my favorite cocktail glasses as well, for bubbles or spirits! I am always on the lookout, but so far have never seen them for sale in SF and no one seems to know what the name of the make is (which is why I certainly do not liberate one or two from various establishments around town whenever the opportunity presents itself). Do you know what they’re called? En angleis, s’il vous plait? Story of Bruno gave me a chuckle in an otherwise gray day. Thank you. Bruno was certainly cantankerous, but I don’t think I ever heard him swear. Actually even more of an insult if you knew the “bar” on the corner. David, I grew up in Berkeley and live in Paris too. I know we have eaten at many of the same places, and since I regularly make your recipes, I know we still eat alike! I remember going to the Zam Zam in about 1990. I will never forget the shape of the bar, and for some reason I have an image of turquoise mosaic as the bar skirt. Perhaps the latter is age and imagination at work. What IS certain is that before going in, I was briefed on what to expect. Apparently, those who had been terrorized took the time to report back. I sat at the bar, I ordered a martini (I thought he served nothing else) and survived the unchanging expression of his face. I have no regrets, it was the best martini I have ever had. Jen, I think that vodka doesn’t have sulfites nor does tequila. Check with a food board or an allergist first, but I’ve heard those two are OK for sulfite allergies. I’m so thrilled about the Toronto recipe! Bought some Fernet the other day because it looked interesting but so far hadn’t found anything that sounded appealing. But we have tons of Canadian Club and Angostura…all I need is the syrup! Love me so Zam Zam. Sadly, I came to SF after the classic Bruno days. But it is still one of my all-time favorite SF institutions. Don’t forget to try the amazing Alembic just down the street towards the park. They take their cocktails very seriously and they make an excellent bone marrow appetizer. Any good tips on where to find a good selection of American whiskeys in Paris? Rye is tough to find. Bourbon is not so hard to find, but it seems to be the same small selection everywhere (though I was able to find Buffalo Trace at the Auchan at La Defense for awhile, but it looks like they’ve stopped carrying it). My current solution is just to bring stuff back with me when I’m in the US, where I travel pretty frequently for work, but that means checking a bag on the way back (the duty-free in San Francisco is expensive and never has what I want). Plus I end up bring back the same old stuff again and again instead of new and interesting things…. Very few liquor shops know what rye whisky is in Paris (a bartender I recently encountered didn’t know what it was either!) I get mine at La Maison du Whisky – they carry several brands. I’d be surprised if Lavinia near Place de la Madeleine didn’t have a few kinds, there’s Julhès (which has funny opening hours but is a good place to stop in) and I know they carry one or two brands at La Grand Épicerie of the Bon Marché. I had meant to send you this link to a video of a guy making small, water-tight barrels. I didn’t get all the way through the video, but I did get the impression that he is in Europe somewhere. Maybe you’ll find it worth your while to track him down, and get some more batches of cocktails aging. Santé!